Perhaps one of Studio Ghibli's final films following the retirement of Hiyao Miyazaki, 'The Tale Of Princess Kaguya' (★★★½) sees the return of studio co-founder Isao Takahata more than a decade after his last film, 1999's 'My Neighbors the Yamadas '. Nominated for Best Animated Feature at the 2015 Oscars, the film is a throwback both in terms of its hand-drawn nature and basis on a famous Japanese folktale. A bamboo farmer finds a mysterious baby within a bamboo stalk, raising the rapidly growing child with his wife in their rural home. Her down to earth childhood is soon abandoned as the farmer uses gold and linen provided by the stalk to transform Kaguya into a princess, against her wishes. Quite surprisingly, considering the depth of work required, the film is unnecessarily long but the animated style is wonderfully languid, turning suitably frantic at times of distress. 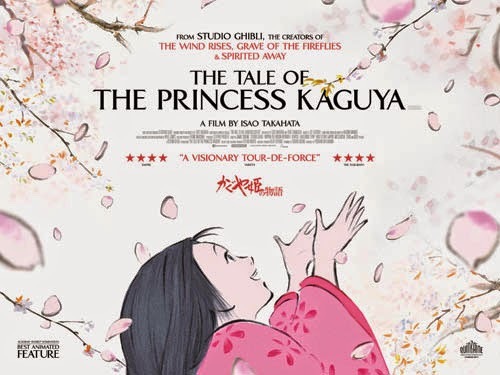 'The Tale Of Princess Kaguya' is classical in style and substance. Nickelodeon television series 'SpongeBob Squarepants' spawned a film spin-off in 2004 with 'The SpongeBob Squarepants Movie' - the last act of creator Stephen Hillenberg before his return as story writer and exec producer on this sequel. Bringing together the usual band of characters including SpongeBob, Patrick Starfish, and Plankton, 'Sponge Out Of Water'(★★) sees them on their biggest adventure yet in this CGI/live-action hybrid. Antonio Banderas is on hand as the villainous pirate Burger Beard and our "heroes" team up against him in a typically surreal and colourful tale. The quirks are unlikely to win over new viewers but existing fans may enjoy much of the action - although the latter live action-driven half is a significant improvement on the relatively slow build up. The lunacy becomes somewhat grating by its end and the teamwork theme song merely proves to remind that 'The LEGO Movie' offers something similar, and does it better. Hopes weren't high for the big screen incarnation of the much loved Paddington Bear, with Colin Firth leaving the production and the creepy promotional material. However our fears were misplaced, and Paul King's film comes to DVD and Blu-ray as one of 2014's most successful British films. I didn't find 'Paddington' as warm hearted and witty as many others did, but it does carry a certain charm and has a welcoming, pro-immigration stance. Tom Hardy picks up another accent in Brooklyn-based crime drama 'The Drop' - the latest Dennis Lehane story to be adapted for film. Hardy is a bartender at a "drop bar", where money is laundered, under the management of James Gandolfini's Marv. Hardy's character yearns for a simpler lifestyle but his terse interactions with Marv and an unhinged Matthias Schoenarts block his escape. Worth watching for the incredibly cute puppy that features for much of the film. Read more thoughts in On Camera #10. Speaking of dubious behaviour, death threats are being sent to the BBC director general following Jeremy Clarkson's rightful sacking. 'Downton Abbey' comes to its end at the conclusion of the forthcoming series, and The Atlantic looks at its "necessary death".